If you're a shopaholic, then you really can't go wrong with Maui. There are tons of choices, no matter what your shopping style. Want high-end luxury? Head over to south Maui's The Shops at Wailea and you'll find all the name brands; there's everything from Billabong and Gap to Gucci and Louis Vuitton! If you want a proper suburban shopping mall, then head for Kahului's Queen Ka'ahumanu Center. Heck, there's even a Costco in town, which is THE place to go if you want to stock up on macadamia-nut chocolates at bargain prices (great edible souvenir gifts)! Front Street in Lahaina is a classic destination for Maui art galleries and shopping, and for good reason. For one, it has a really nice chilled out beach town vibe. 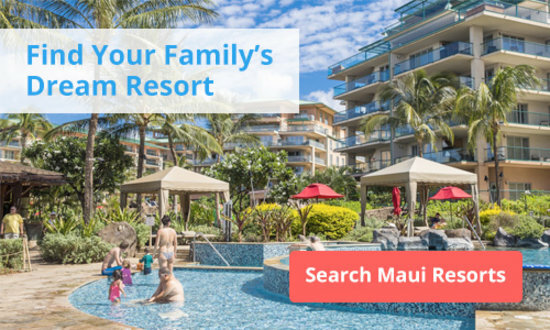 Plus, you'll find every kind of souvenir (tikis, 'ukuleles, Hawaiian shirts), loads of dining options, and lots of cool tourist attractions too. But what makes this place different from anywhere else on the island is the art. 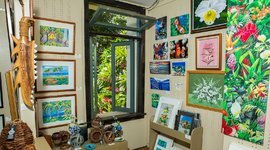 There are dozens of art galleries along Front Street where you can see the work of world-renowned artists, many of whom live and work on Maui. And this isn't the kind of place with art priced exclusively for the rich and famous either – there’s something for every budget. And Friday evenings are best – it's officially Art Night. You'll get to meet some of the artists, plus enjoy free pupus (appetizers) and wine from 6-9 pm. After that, it's shopping time! Lahaina Cannery Mall is a classic destination for families. Sure, like any mall, you can pick up all kinds of souvenirs and supplies. But they set themselves apart by putting on free cultural activities and entertainment. 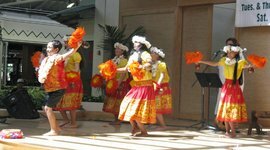 There’s a free hula show every Tuesday and Thursday at 7 pm. There's also a Keiki Hula Show, that's great for kids, every Saturday and Sunday at 1 pm. Last, but not least, if you've ever fantasized about playing the 'ukulele at sunset under a palm tree on a Maui beach, you can learn to play with their free 'ukulele lessons every Tuesday at 5:45 pm. 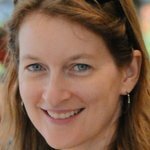 So you know how other travelers make it sound so amazing to “hang out with the locals,” but nobody ever tells you how to find locals that will want to just “hang out” with you? The weekly Maui Town Parties are the answer you've been looking for. 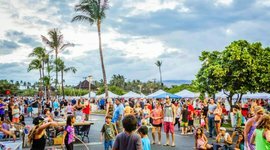 Every Friday night in Maui from 6-9 pm, one of the local towns puts on an evening street party. These parties are the real deal – they're not exclusively for tourists, and you'll find a wide variety of people from all walks of life. There's live music, local food stalls, and places to buy local crafts too. 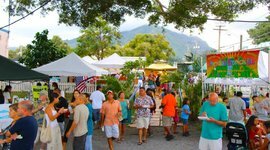 The first Friday of the month, it's held in central Maui's Wailuku. 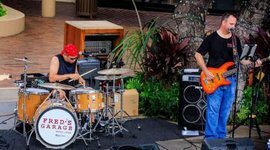 The second Friday is reserved for west Maui's Lahaina. 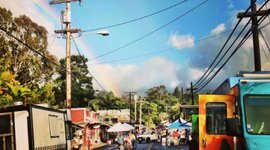 The third Friday, you'll find the party happening in Upcountry's Makawao. 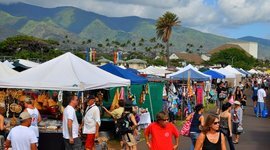 And the fourth Friday town party is held in south Maui's Kihei. If you want to "hang out with the locals" this is how you do it! The activities can vary a bit from week to week, so before you go, check out their website for details on what's scheduled. Want to feast your eyes on the largest selection of locally made crafts that you've ever seen in one place? Then head to Maui shopping heaven at the Maui Swap Meet. You'll find everything from clothing, to carvings, to jewellery, and even locally-grown produce - it's the perfect place for souvenir shopping. It'll only cost you 50 cents admission, and anyone aged 12 and under gets in free. 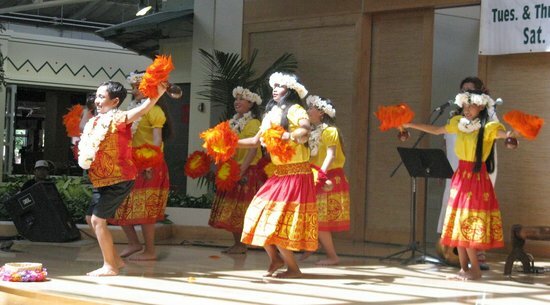 It's held every Saturday from 7 am to 1 pm in Kahului, at the UH Maui College on Ka'ahumanu Avenue. Tip: Go early because shopping at the outdoor booths can get very hot later on in the morning. And as a bonus, the earlier you go, the better the selection you'll have to choose from!